Audemars Piguet has an uninterrupted history of creating exceptional calendar watches that goes back to the company’s origins over 140 years ago. According to the Audemars Piguet Archives, the first perpetual calendar wristwatch was made and delivered in 1950. However, as important and collectible as vintage pieces are, these perpetual calendar wristwatches lacked the defining element of the perpetual calendar pocket watches that preceded them —the leap year indication. Available in stainless steel, 18K pink gold and in black ceramic, this new Royal Oak Perpetual Calendar in platinum ref. 26574PT is the best looking Royal Oak released by AP in the last couple of years. An immediate grail, the new Royal Oak Perpetual in Platinum with Ice Blue dial is exclusively available in a limited edition of only 50 pieces. This new iteration of the Royal Oak Perpetual Calendar remains at 41 mm with a total weight of 238 grams —as a reference the total weight on the rose gold models is 253 grams. The beauty of this new watch not only comes from its top heavy —due to the density of platinum— and underrated platinum case but from the incredible ice blue dial with highly contrasting navy blue rings around the subdials. The ice blue dial along with its dark blue rings subdials makes for a very eye-catching combination. Thanks to the enlarged size of the case, the watch features a 'Grande Tapisserie' —to learn more about the different types of tapisserie go to this article we published some time ago— dial design that greatly increases the overall aesthetics, balance and legibility of the perpetual calendar indications. One of the great things about this dial, is that is fitted with luminescent material on the applied markers and hands, something really uncommon in a perpetual calendar. The layout of the dial includes all of the traditional indications of a perpetual calendar watch: day, date, highly detailed astronomical moon, month and leap year. In addition, just like on the 120th Anniversary Royal Oak Quantième Perpétuel ref. 25810OR.OO.0944.OR.01 the 52 weeks of the year are indicated by an outer chapter ring with corresponding central hand, adding another layer of time measurement. With a very clean layout in our opinion but that to some might appear slightly busy, the dial features month and leap year indicator at 12, day of the week at 9, date at 3 and moon phase indicator at 6 o'clock. The aventurine disc on the moon phase indicator is the icing on the cake when it comes to this new generation of the AP Royal Oak Perpetual Calendars. 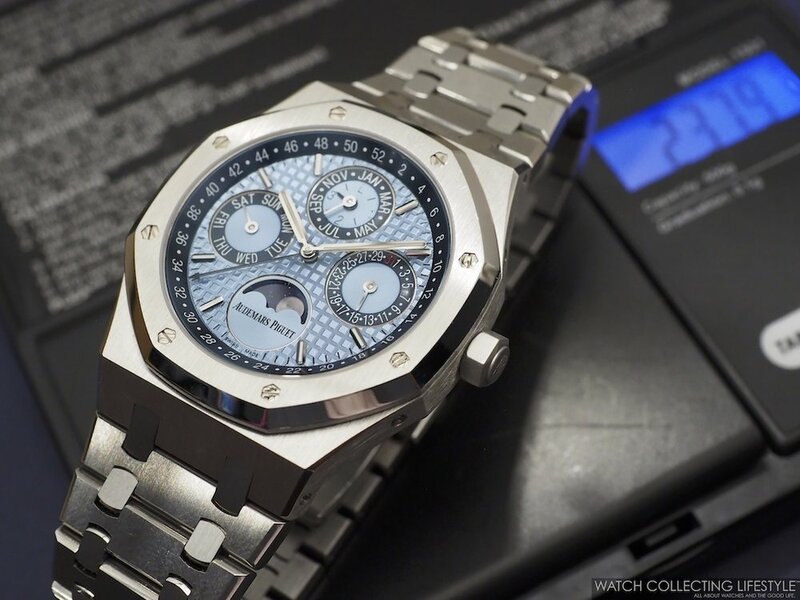 Like its siblings, the Audemars Piguet Royal Oak Perpetual Calendar Platinum Ice Blue Dial ref. 26574PT.OO.1220PT.01 is powered by the new in-house automatic calibre 5134 based on its predecessor the calibre 2120. The movement has a total thickness of 4.31 mm and a diameter of 29.00 mm. Composed of 374 parts and 38 jewels, the movement provides a power reserve of 40 hours while oscillating at a frequency of 19,800 vph. The oscillating weight —this time not in rose gold as it usually is— is guided by a peripheral ring rolling on four ruby runners, which reduces friction and wear to the minimum possible. On the wrist, the watch wears simply out of this world. As mentioned before, the watch wears slightly smaller than its actual size and more like a 40 mm piece on a 7.25-7.5" wrist. Available in a limited edition of only 50 pieces. Literally, grail status for this watch and one that without hesitation is the hottest Royal Oak Perpetual Calendar in 41 mm ever released. Exclusively sold at the Audemars Piguet Boutique in Geneva, Switzerland.